The Annapolis Police Department is seeking information on the identity of the subject pictured below in reference to a theft that occurred on September 27, 2012 at Return to Oz, 2011 West Street in Annapolis. 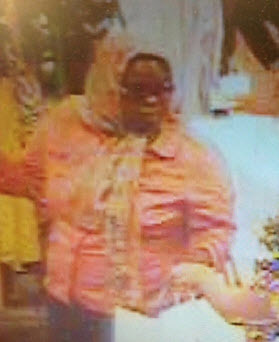 The suspect stole a purse containing credit cards. These credit cards were then used at multiple locations at the Annapolis Mall. Please contact Det. Murphy at 410-562-7759 or 410-268-9000 ext. 7268 with any information. Case # 12-5216.